In 2018, the U.S. Securities and Exchange Commission granted its largest SEC whistleblower awards as of that date. It also received more SEC whistleblower tips than it had in any prior year. 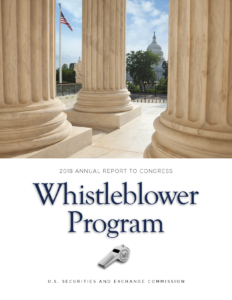 Those facts come from the SEC’s 2018 annual report to the U.S. Congress about the SEC whistleblower program. This annual report is a major source for SEC whistleblower information. Another SEC whistleblower reward of $39 million was granted to a different whistleblower. The SEC received 5,282 tips from whistleblowers during 2018.